In the world of apps and add-ins aimed at providing better management for Outlook there is some space occupied by the syncing means. Our company is working in this field for over 8 years. One of our well-known products for Google calendar sync, Outlook4Gmail is highly valued by our users all over the world. We struggle to make it more performative by adding new useful features. 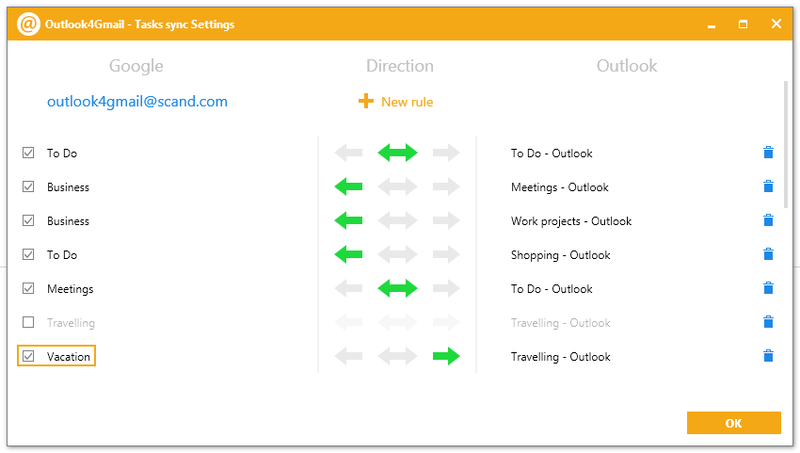 The recent Outlook4Gmail update to version 5.0 performs Outlook tasks sync with Google. Enables three way tasks syncing options. It means that you could import Google tasks into Outlook, as well as perform a reversed action, or mix the tasks from Outlook and Google by performing two-way synchronization. Regular task synchronization. The user has an opportunity to set an interval for task synchronization. The option allows to set up from 30 min up to 24 hours. Syncing recurring Outlook tasks with Google task list. Syncing task lists from multiple Google accounts. We hope that you will enjoy this new feature! Outlook4Gmail has its limited version (only Google contacts sync with Outlook) which is available for free. A full commercial version with a year client support and free updates are also available. It helps you to sync Google calendars with Outlook, Google contacts with Outlook as well as to sync the tasks. Stay tight, keep up with our new updates, and follow Outlook4Gmail social network groups. Please don’t hesitate to send us any feedback regarding the new version as well as your ideas and wishes about future versions functionality: outlook4gmail@scand.com.